The detail above shows water of a lake on the Georgia-North Carolina border. The one below is the view with the water away from the shoreline. It's part of a watercolor used as a reference to create the oil painting. The patron who commissioned the oil wanted the scene shown as as a lake filled with water. The second painting below is a watercolor done en plain air at the site. The watercolor sketch looks into North Carolina from a lake in North Georgia. An in-studio oil painting (see detail below) was done from this and another sketch. 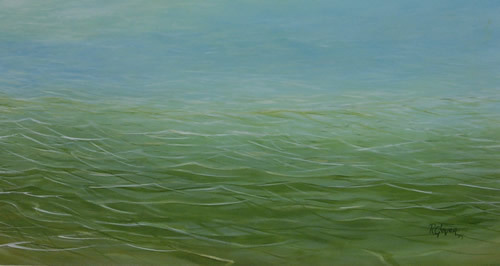 Detail of a 24" X 36" oil painting. Detail of the bottom of the work (lake water) shown at the top of this page. 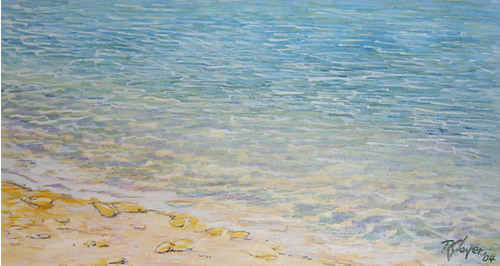 Also, there's a detail from a watercolor done of the same mountain and lake scene. What you see here is linked to a full view of the oil painting. 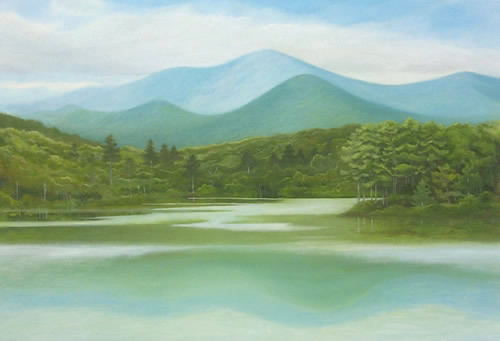 CLICK HERE for another oil painting of a Georgia/North Carolina mountain scene.